The second expansion of Forza Horizon 3, named Forza Horizon 3 Hot Wheels, will arrive on May 9 exclusively for Xbox One and computers with Windows 10. 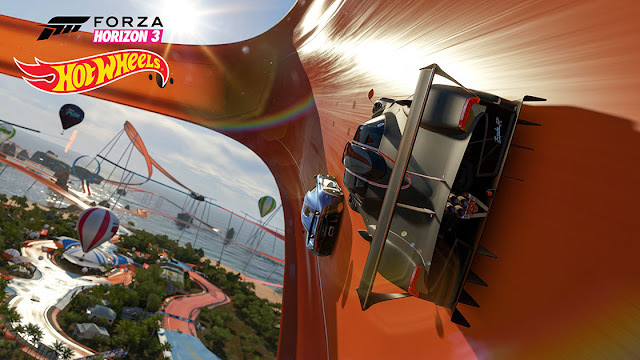 This expansion will allow players to travel to several new locations in Australia, a region where the conduction Sundown got replaced by high-speed acrobatics in loopings and the giant, iconic and orange Hot Wheels tracks. The expansion will include classics from this collection of toys such as Twin Mill, Rip Pod, and Boneshaker. Forza Horizon 3 Hot Wheels promises an experience never seen in the history of Forza. In Forza Horizon 3 Hot Wheels, you can race on six thematic islands located on the coast of Australia; All connected by a Hot Wheels motorway to hundreds of meters in the air. In those sections, we will find classic Hot Wheels configurations like loops, corkscrews, and many others. This acrobatic driving will test our skill by playing Forza with elements like acceleration zones, crazy spins, half pipes, incredible leaps and even giant mechanical dinosaurs. If what you are looking for is a creative experience and check out the new stunt exchanger to modify the different sections and challenge your friends to try them out. As a personalized race but with other types of obstacles more wild and fun. Explore the world of Forza Horizon 3 Hot Wheels through a new campaign: complete all kinds of tests on your way to be the best acrobatic driver with an epic grand finale on the new Hot Wheels Goliath circuit. Connect with your friends and compete online on the different courses or show who has more skill in the new Playground Arena area. All this along with 28 new achievements and 500 Gamerscore points. Forza Horizon 3 Hot Wheels expansion pack will come with ten new cars, including the 1969 Hot Wheels Twin Mill, 2011 Hot Wheels Bone Shaker, 2012 Hot Wheels Rip Rod, 2005 Hot Wheels Ford Mustang, 2016 Jeep Trailcat, 2016 Zenvo ST1, 2007 Toyota Hilux Arctic Trucks AT38, 2010 Pagani Zonda R and 1972 Chrysler VH Valiant Charger R/T E49. Forza Horizon 3 Hot Wheels goes on sale May 9 on Xbox One and Windows 10 PC at a price of 19.99 euros. All those who already have the season pass of Forza Horizon 3, will be able to download it for free of cost.